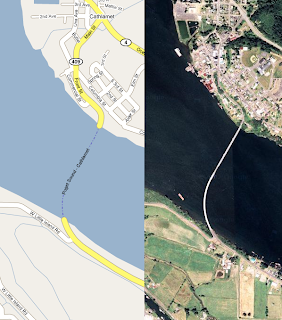 Google maps shows Washington SR409 as a ferry across the north channel of the Columbia, from Puget Island to Cathlamet. This is curious, as the truss bridge shown in the satellite photo was completed in 1939. Google's routed directions are quite misleading, as they estimate 20 minutes taking the ferry across the half-mile span. With good timing for the ferry across the south channel, and permission from my tripmates, I aim to explore the area on Sunday.